There are a group of students in a class. Each student should have their own Facebook page or group for the class but they shouldn't have to friend each other. Each student's page will be maintained by them and they should be the only ones allowed to post on their page/group. They have to post pictures on their group/page and view other students' groups/pages. The student's personal information should be kept private from anything the class requires of them to put on the Facebook page/group. Have each student make a "secret" group for their page. They'll be the manager's of their own group. The only problem is that they shouldn't have to friend each other on Facebook for their own privacy, so how can they invite others to the private group? Each student make's a public page for the class. As admin of their page, they only allow their own posts on the page, then everyone else in the class can just Follow the page. This may be annoying because there are a lot of people in the class, so each student will be following up to 40 pages. The second one seems to be the better idea in my opinion, but I was wondering if there's a better way to connect students via facebook? Secret groups make it impossible for students to join it if they have not been invited. Pages are what you need because the information will be publicly available without the need of "being friend" or "asking to join". So, take the 2 and leave the 1. Additionally, there is another Facebook feature you could make use of to link the different pages: interest lists. The goal of a list is to feature a set of pages. Anyone could overview what pages exist and then decide either to like them or not. You can add people to a secret group without friending them first. Here is the "add member" interface for a secret group I am a member of. Notice the "Invite by Email" option. Clicking this brings up the following dialog that a student could use to add a member who is not currently a Facebook friend. Which one is better? 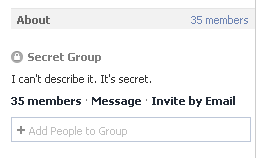 If you're trying to keep non-students from interacting with the page/group at all - ever, then the secret group is the way to go. But a group and a page are two different things. I think you really need to decide which feature set is really more applicable to what you are trying to do. Not the answer you're looking for? Browse other questions tagged facebook facebook-privacy or ask your own question. How to send a private message to a Facebook user?